Francois Isnard was the father of Pierre-François Isnard, reputed inventor of the 'little soldiers' of Strasbourg - I What is the relationship, if any, to Pierre Isnard, engraver of the F Laudier of Strasbourg cards 1746? Francois Isnard chose master cardmaker David Benoist and his wife as Godfather and Godmother of his two children born in 1923 and 1925 - so may we presume that Isnard was engraving his molds for the Benoists, as well as other cardmakers, at this early period? "François Isnard le père, outre qu'il travailla pour les éditeurs strasbourgeois, semble surtout avoir gravé des jeux de cartes pour des maîtres-cartiers comme David BENOIST, qu'il prit, ainsi que sa femme, comme parrain et marraine de deux de ses enfants, nés en 1723 et 1725, et FRANÇOIS BOUCHAUD, qui devint vers 1759 son gendre et dans la maison duquel il mourut, place de la Cathédrale, le 19 janvier 1765." "Master-cartier David Benoist's name first appears in 1717 in the minutes of the Stelz guild. He successively hires cardmakers Claude Chamonet of Dijon (1717), Pierre Ran of Liège (1720), Marc Bouvard of Chambéry (1721), Jean Poursi (or Borsi) of Cleremont (1721) and Claude Thomasin, native of Armelin in Savoy and some others, including Jacob Spath Solothurn already mentioned above -"
"Master-cartier David Benoist's name first appears in 1717 in the minutes of the Stelz guild. p. 56 Jean Louis Ducmain, kartenmacher (6I) gesell von Liège bey herm Louis Laboisse, stehet vor und hat über die ordnung geschwohren. p. 82 Claude Chamonet, kartenmacher gesell von Dichont bey herm David Benoist, kartenmacher, stehen vor undt haben über die ordnung geschwohren. p. 94 François Fournier, kartenmacher gesell von Marsaille aus Provance bey herrn Louis la Boisse in diensten juravit. p. 146 Isaac Stein, der kartenmacher von Colin gebürtig, erscheint und producirt cantzley- pfenningthurn und stallschein, bittet jhme das zunft- und stubenrecht gedeyen zu lassen. Erkannt gegen erlag der gebühr willfahrt. p. 238 Claude Thomasin gebürtig zu Armelin (146) in Savoyen, der kartenmacher bey hern David Benoiste, stehen vor und haben über die ordnung handtrew abgelegt. p. 239 Guillaume Affine, kartenmacher von Albij (147) in Languedoc erscheint und producirt cantzley- stallund pfenningthurnsschein de 3. aprilis 1723 ; bittet umb das zunft und stubenrecht. Erkant : wird demselben in seinem petito gegen erlag der gebühr willfahrt. Juravit. p. 265 François Gallon, kartenmacher gesell von Overne (l59) bey herm Guillaume Affine stehet vor und hat geschwohren. 1729 --- In einer allhier Zu Straßburg in der Flader Gaß gelegener und dem Ehemann Zuständiger behaußung ist befunden worden wie folgt. (M.) Eigenthumb ane einer behaußung. Ein hauß, hoffstatt und höffl. mit allen deßen begriffen, weithen, Rechten, Zugehörden und Gerechtigkeiten gelegen allh. Zu Straßburg in der Flader Gaß, einseit neben Johann Michael Kräutler dem hohltreher 2.s neben Philipp Jacob Zelter dem Maurer, hinten auff H. David Benoist den Kartenmacher stoßend. Sieur Arnold La Gardelle Entrepreneur und burger alhier, Kläger Contra David Benoiste den Kartenmacher alhier, daß derselbe des Klägers seinen Sohn Zu seinem Lehrjungen angenommen, solches aber nicht berechtiget geweßen seÿe, in deme derselbe bereits noch Zweÿ Lehrjungen habe, und alßo den dritten Zuhalten, Zufolg Kartenmacher Articul Von Paris ungültig, damit nun Kläger seinen sohn Künfftig in Franckreich alß Gesell Passiren Könnte, wollte Er gebetten haben nicht nur den beklagten anzuhalten, daß er die bereits empfangene erste helffte Lehrgeld, sambt denen causirenden Uncösten ihme refundiren, sondern auch sein Sohn die rücrkständige Lehrzeit beÿ einem andern Lehrmeister Vollenden Könne. Beklager Benoiste sagt Zur Antwort weillen die alhießige Kartenmacher, wegen Haltung deren Lehrjungen Keinen Articul haben, mithin soviel annehmen Können, als sie wollen Zudeme er nicht dreÿ Jungen habe, wie Kläger Vorgiebt, anerwogen beÿ annahm des Klägers seines Sohns sein einer Lehrjung außgetretten und sich unter Königlichen Kriegsdienst begeben den Zweÿten aber Er Gratis und aus barmhertzig Keit angenommen, als bittet Er Kläger anzuhalten, dem Zwischen Ihme den 11. Junÿ Anno 1736. errichteten Accord nachzugeleben, einfolglichen zuverordnen daß deßelben Sohn, seine rückständige 2 ½ Jahr Lehzeit beÿ Ihme Zuvollenden schuldig seÿn solle. Erkand, seÿe Kläger Zuerlauben, daß sein sohn beÿ einem andern Meister sein rückständige Lehrzeit, aushalten, hingegen beklagter die Ihme bereits behändigte erste helffte Lehrgelds Zubehalten berechtiget seÿn möge, die heutigen Uncosten aber seÿe beklagter dem Kläger zu refundiren schuldig. H. Charles Antoine Simon Grodval der handelsmann und kartenmacher alß geordnet und geschworener vogt weÿl. fr. Catharina Schoenau gebohrne Housset Carl housset des kartenmachers Zue Nancy erzihlte tochter, Verheurathet mit Niclaus Schoenau dem schifferdecker Und burger allhier erhaltet das burgerrecht a marito umb den alten burger schilling, doch aber daß sie Löbl. Statt Straßburg seith getroffener heurath biß anhero schuldige abgaben Zahlen sollen, wollen dienen Zue E.E. Zunfft der Maurer promisit d. 3.ten jenner 1785. Later a Spanish Kartenmacher with the name Fournier became very important. 1785 Francisco Fournier went to live to Burgos due to the revolution which was happening in France. He was French, and all his family worked as printers. When he went to live to Burgos, he married a wealthy Spanish woman called Maria de Reoyo. They had a children called Lazaro Fournier. Lazaro married another Spanish woman called Paula González. They had four children. The youngest was born on 2 March 1849 and he was called Heraclio Fournier. Pope and and Popess are changed to seasons. 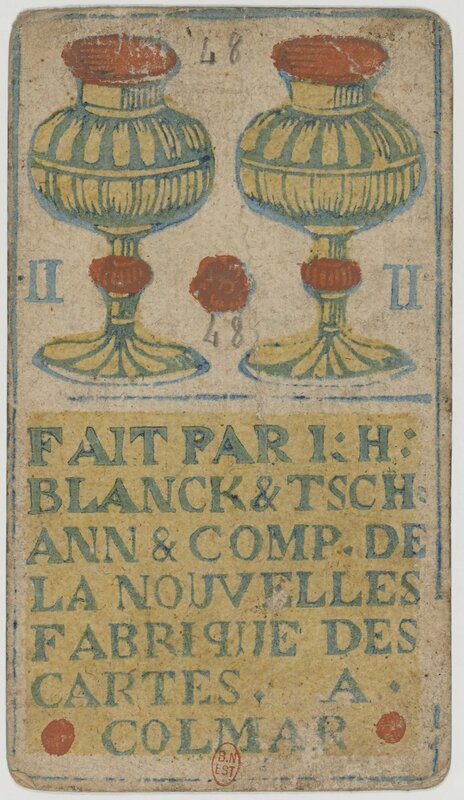 According Depaulis this deck type might have preceded the Tarot Besancon. Laboisse (above mentioned for 1718) was important in relation to this deck. It's interesting, that he had a helping hand from a man of Marseille, which is the mentioned Fournier. Marchand-cartier actif à Colmar de 1775 à 1792. - Epouse Marie-Elisabeth Knecht, originaire de Sélestat, en 1756. - Reçu bourgeois le 19 janvier 1765. - S'associe avec son gendre Stéphane Amand Tschann, originaire du canton de Soleure (Suisse) à partir de 1775, sous la raison sociale "Blanck & Tschann & Comp." 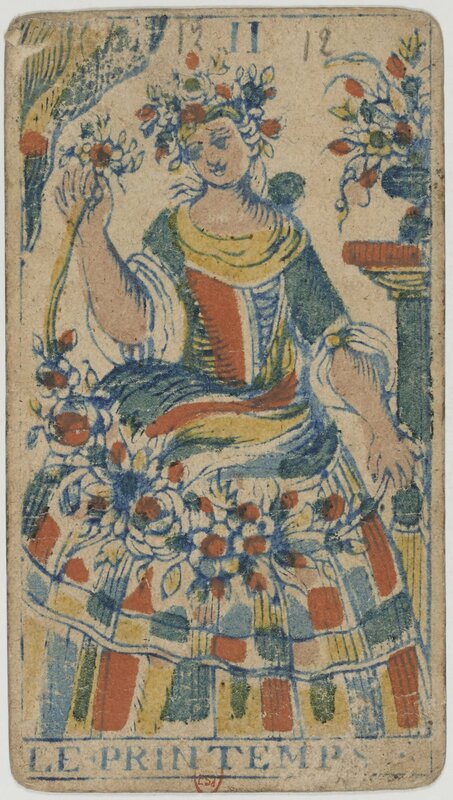 So the deck is NOT from the early period, but Depaulis had found a similar to one of the seasons , which was made in the first decade of 18th century, as far I remember. "Louis de La Boisse, a la Perle Orientale a Strasbourg"
Here also the Oriental Pearl motif on four of coins copied by Jean Henry Blanck active in Colmar from 1775 to 1792. in association with his son-in-law Stephane Amand Tschann, from the canton of Solothurn (Switzerland) from 1775, under the name "Blanck & Tschann & Comp. La Boisse was from Paris, as was I[ean] N[oblet] ? La Boisse Junior moved to Strasbourg in 1705 and became a citizen in 1708 and died in 1748. January 1737 with entries about journeymen who worked for him, according to the Daniel Schulz catalogue linked to below. To access "Ask Alexander" you have to belong to the IPCS (or some other affiliated association) and do it through their website. It costs $16 a year to belong, with current issues of the "Playing Card" available as pdf's. The "48" on the 2 of cups and the "74" on the 4 of Coins correspond precisely to Etteilla's number for that card. Earlier you speculated that the handwriting on the 4 of Coins might be Etteilla's due to the "74' on the card. But why are these same numbers on different cards? Did he get his numbering system from these cards, or are these all his cards? We know that Etteilla spent time in Strasbourg. around this time. I didn't see a Star card in the Gallica link for this deck. There is one for the one with cartomantic notes, the Sarramon, at http://gallica.bnf.fr/ark:/12148/btv1b1 ... 23.highres. Indeed no "butterfly". I wonder if that is consistent, or if one actually has a "butterfly". The "48" on the 2 of cups and the "74" on the 4 of Coins correspond precisely to Etteilla's number for that card. Earlier you speculated that the handwriting on the 4 of Coins might be Etteilla's due to the "74' on the card. But why are these same numbers on different cards? I haven't checked the numbers of every card to see how they correspond, but enough to suggest the writer was familiar with the work of Etteila -- 17 is death, 78 the fool, he has made the lovers 13 the card of marriage instead of the Pope, maybe that has something to do with the replacement of the pope by winter? The other examples I've seen of Isnard shows neither a butterfly nor a bird - the bird is part of the Tarot de Marseille pattern rather than the TdB, it likely was never on a Benoit old block to be removed -- perhaps Etteilla mistook the bird of the Tarot de Marseille for a butterfly, his perception of it influenced by Gebelin* (who was using a Tarot de Marseille, unlike Mettlet who was using a TdB)? Here we have under our eyes a card no less allegorical, & absolutely Egyptian; it is entitled the Star. Indeed, one can see there a brilliant star surrounded by seven smaller stars. 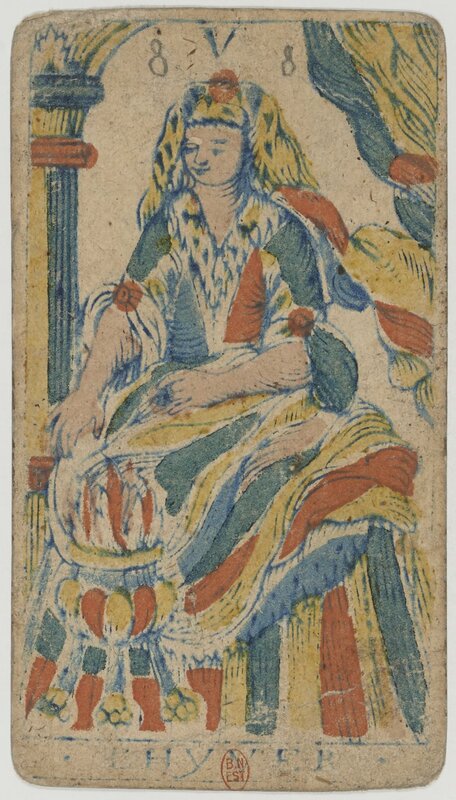 A woman bending on one knee who holds two vases upside down and from which two rivers run occupies the bottom of the card. Next to this woman is a butterfly on a flower. Court de Gebelin: Du Jeu Des Tarots, volume 8 of Le Monde Primitif 1781.